FIRST, WHAT IS REAL CONSERVATISM? WHAT IS ALT-RIGHT? IT’S VIEWS AND PRINCIPLES. The term is shortened from “alternative right,” and it’s associated with white nationalism, leading to a growing chorus of concern because Trump’s new White House strategist, Steve Bannon, is a well-known Alt Right-affiliated Internet provocateur. The term has been defined as “a loosely organized group that espouses white nationalism” and “emerged as a counterpoint to mainstream conservatism.” Alt Righters – often young white male intellectuals who are wired into social media – have repackaged white supremacy into what they label a white identity movement. Considered racist by those who monitor hate groups, Alt Righters rail against traditional Republicanism, express support for Trump, and trash multiculturalism, political correctness, and globalism. FIVE BASIC PRINCIPLES/VIEWS OF THE ALT-RIGHT. 2. The Alt Right Grew Out of the Internet Culture. …Alt Righters on Twitter have used the medium to harass people of Jewish descent, said CBS. US President-elect Donald Trump has supporters among the Alt Right. …Trump earned controversy when he retweeted a Star of David, which originated on Alt Right websites. 4. Trump’s New White House Adviser is a Member of the Alt Right & the Alt Right Has Embraced Trump. Trump campaign CEO and former executive chairman of Breitbart News Steve Bannon arrives for a Wisconsin rally. 5. Twitter Banned Several Alt Right Figures After the Election. 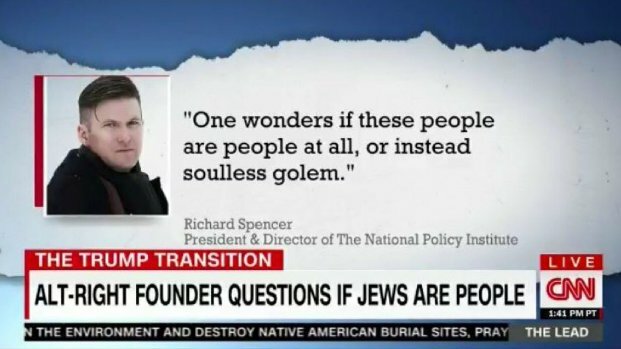 Yes, Richard Spencer, an advocate, supporter and friend to Bannon and DT was kicked out of Hungary for National SOCIALIST, aka Nazi, activities. As are ALL forms and types of SOCIALISM/LIBERALISM it is doomed to failure, the world-view has NEVER succeeded anywhere at anytime. no larry, I am none of the above but you are a buffoon. Your 7 points are bass ackwards like I see you are as well. I write for new sources other than the lamestream media so I guess you are calling me all these things? If this is any indication of how you preach, you are an apostate without doubt. may God have mercy upon your flock. Your 7 points for alt-right come from that deep dark crevasse you apparently have your head shoved up high and tight. You call names- but no proof. You make assertions- but no proof. You disagree with my points, which are ALL validated- but no proof. You disagree with any/all sources that are not Breitbart, aka Trumpbart, or an echo of them- but no proof. 2) support you Moon-Bat blather in any way. That means you CAN NOT do so. I’LL stick to facts, evidence, proof and truth.